George Brough was a man who wanted to build motorcycles that were “superior” to everything else being made: and he wanted to do it using “off the shelf” parts from other manufacturers, which was a pretty tall order. The fact that he succeeded is testimony not only to his engineering ideas, but also to his marketing instincts. George Brough advertised his bikes as “The Rolls Royce of motorcycles” which of course led to his receipt of a lawyer’s letter from Rolls Royce demanding that he stop doing that. George’s response to the letter was to invite Rolls Royce representatives to his workshop to see Brough Superiors being made. When they visited, the Rolls Royce representatives were shown spotlessly clean workshops staffed by nice young men in clean white lab coats meticulously building Brough Superior motorcycles. The Rolls Royce men were so impressed that they decided that George Brough could continue to advertise his bikes as “The Rolls Royce of motorcycles” after all. George Brough admired the prestige of the Rolls Royce name and wanted his Brough Superior brand name to become just as highly regarded. Once he had established the reputation of Brough Superior motorcycles as being better than any other he turned his attention to the idea of making Brough Superior automobiles. His initial idea was to partner with Rolls Royce to produce his first car and he even built a prototype with a Meadows engine in 1933. But his idea of working with Rolls Royce was abandoned when Rolls Royce decided to manufacture engines for the Austin Princess. Austin was a far too low status automobile maker for George Brough to want to be associated with, even indirectly, so he abandoned the idea of working with Rolls Royce and looked for the best and most exciting alternative: and that alternative was the exotic Hudson Terraplane, which was being very effectively marketed in the United States. 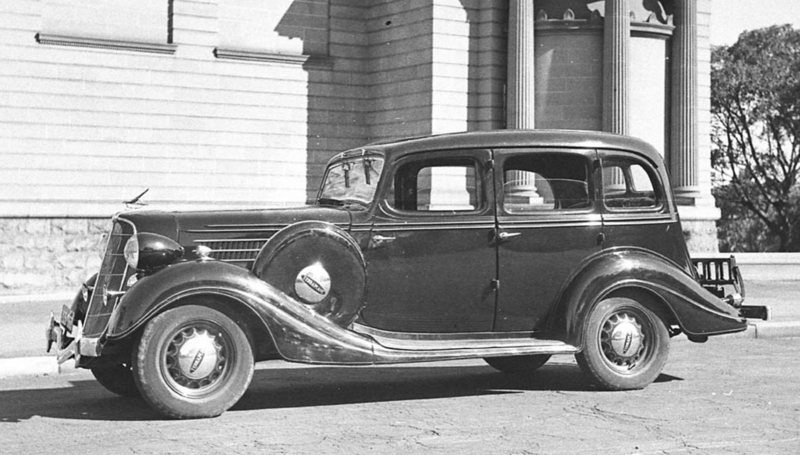 The Hudson Terraplane was the successor of the Essex and when it was introduced in 1932 it was initially called the Essex Terraplane to carry over the Essex reputation as a light and quick automobile: so quick and agile that it had become a preferred car for bank robbers and crime figures. The Terraplane retained the speed and agility of its predecessor with a number of improvements including a “Duo-Automatic” braking system that incorporated both hydraulic and mechanical cable brakes. This was something of a first type of dual system brakes and promised improved safety in a car that was intentionally made at a lower price point than its competitors. 1934 Terraplane. (Picture courtesy State Library of NSW). 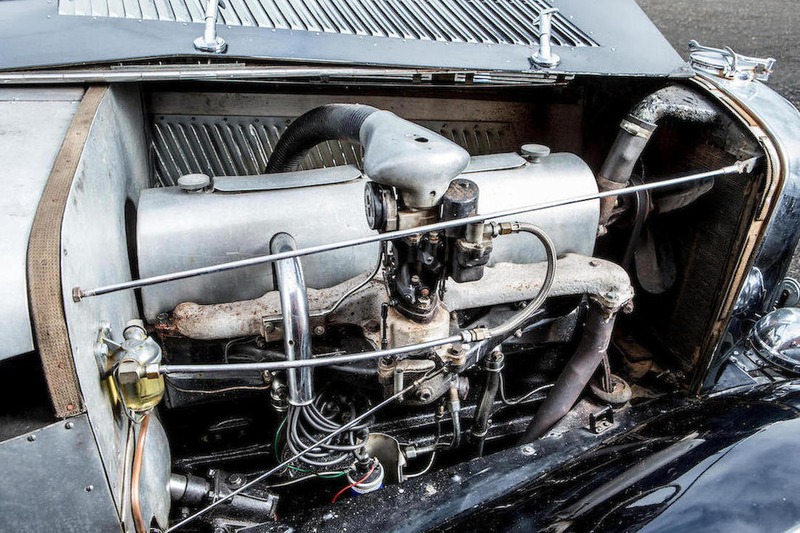 Whilst the lower price point might have initially put George Brough off, the Terraplane’s performance, and the marketing campaign that supported it more than compensated for any initial misgivings he may have had. The Terraplane was owned by notable aviators Amelia Erhart and Orville Wright. The sales slogan for the Terraplane in 1933 was “On the sea that’s aquaplaning, in the air that’s aeroplaning, but on the land, in the traffic, on the hills, hot diggity dog, that’s Terraplaning”. In 1933 the Essex Terraplane became the Hudson Terraplane and was offered with a straight eight engine. 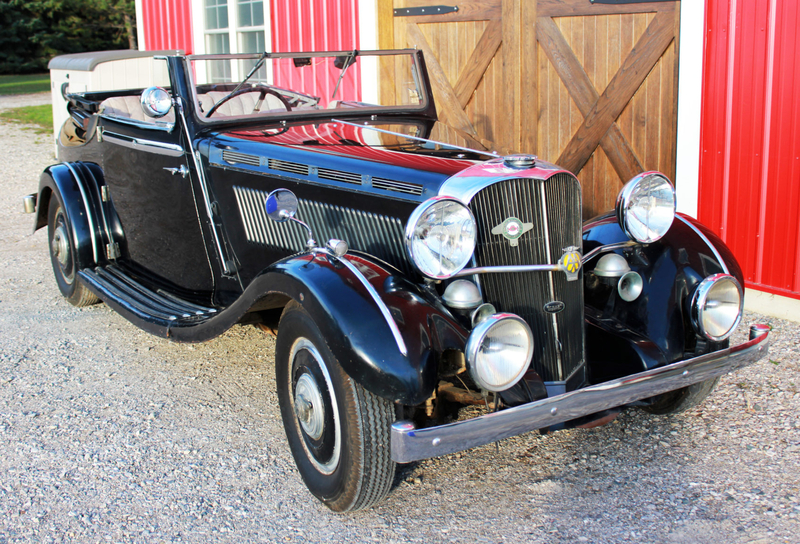 This fast, agile, and relatively inexpensive automobile soon became a favorite not only of famous aviators but also of crime figures, notably John Dillinger and Baby Face Nelson, adding a sense of danger and desirability to the cars. 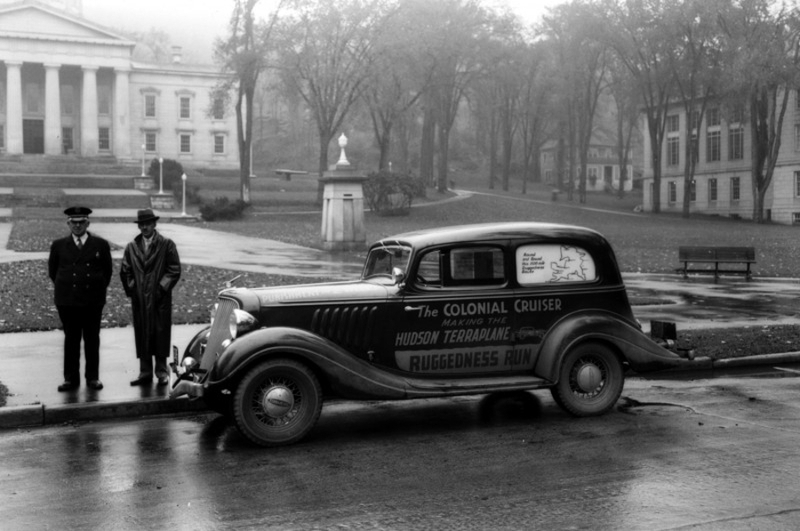 Hudson Terraplane the “Colonial Cruiser” on one of the twenty “Ruggedness Runs” done to promote the car. (Picture courtesy Hemmings). George Brough no doubt watched Hudson’s strategic marketing campaign with great interest. The Terraplanes were entered in various motor sport competitions especially hill-climb events and they set a number of records that held for years after. The icing on the cake were the 1934 “Ruggedness Runs” in which twenty Terraplane owners painted their cars with names appropriate to their state, such as the “Colonial Cruiser” and the “Golden Gate Flyer” and took them on two-week endurance runs of about 1,500-1,800 miles around their state to demonstrate the Terraplane’s dependability. Seeing the effectiveness of the Terraplane’s marketing, backed up with real performance, George Brough decided to base his Brough Superior automobiles on the Hudson Terraplane chassis. Brough Superior 4.2 liter “Dual Purpose”. George Brough’s first automobile built on the Hudson Terraplane chassis was the 4.2 liter, straight eight engined “Dual Purpose”, so called because it had a convertible top and could be an open or closed car. 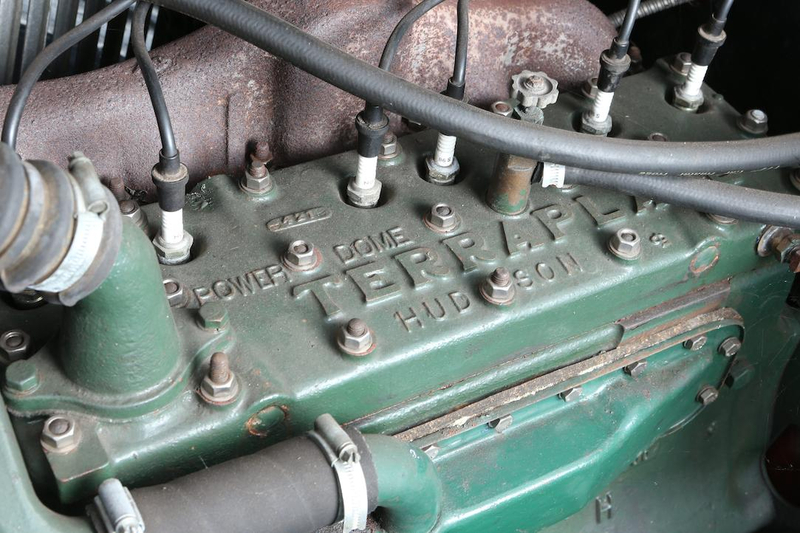 The Hudson Terraplane’s straight eight engine was more smooth than a Rolls Royce, making them rather jealous that Hudson were able to build this smooth and powerful engine at such low cost. These Terraplane chassis were fitted with the standard Hudson three speed manual transmission and the “Axleflex” front suspension which incorporated a jointed front axle. On arrival in Britain these 1934 Hudson chassis were sent to coachbuilder W C Atcherley of Birmingham to be custom fitted with bodywork of Brough’s design that incorporated Atcherley’s patented “Dual Purpose” top, which comprised a folding top designed to fold flush with the body line to keep the appearance of the car streamlined and uncluttered. George Brough claimed the top could be operated by one person to make the car an open tourer or closed saloon in five seconds. The Atcherley “Dual Purpose” top in action: upper picture with top down and lower with top raised. These 4.2 liter (4,168cc) straight eight cars required little gear changing: the engine was so flexible that once the driver had it in top gear he or she would have little need for further gear changing. The car would simply power up hills with aplomb. As the three speed gearbox was somewhat under-engineered for the eight cylinder engine this is probably just as well. The Brough Superior 4.2 liter was fitted with a British Lucas electrical system, Luvax shock absorbers, and a Smiths Jackall hydraulic jacking system to make changing a flat tire a more pleasant experience. The car’s instrumentation featured a speedometer with the “Brough Superior” name prominently displayed at its top center. 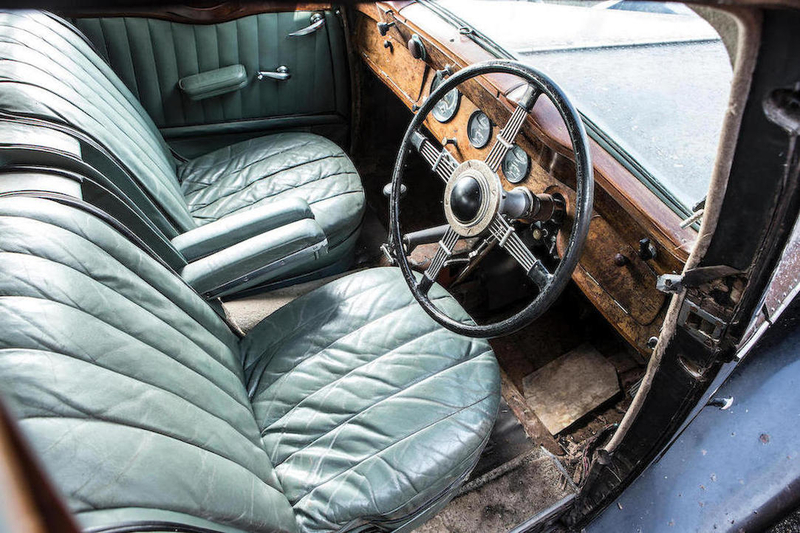 Interior of the Brough Superior 4.2 liter “Dual Purpose”. The 4.2 liter Brough Superior “Dual Purpose” lived up to George Brough’s expectations as being a car that was at least as good as a Rolls Royce, despite being built on a more economical chassis. The straight eight engine required no oil pressure but instead was lubricated via a system of trays in the sump with little scoops at the end of each big-end journal. These engines were expected to last 500,000 miles with one example doing 378,000 miles before it needed any major work done on it. The only potential downside of this engine for George Brough was the fact that it was a side-valve unit, at a time when overhead valve engines had become the fashion. George Brough tackled that imagined problem by fitting the engine with an aluminum cover that made it look like an overhead valve engine. The Hudson straight eight engine was a side-valve unit: so George Brough fitted an aluminum cover so it looked like an overhead valve engine. The eight cylinder 4.2 liter Brough Superior’s engine was rated at 28.8hp (RAC rating) producing 125 bhp, and gave the car a standing to 60 mph time of 10 seconds. Despite this promising start for George Brough trouble was to come in the form of another lawyer letter however. This time the letter was not sent to George himself but to Hudson from British car maker Railton, who had entered into a contract with Hudson to supply the straight eight Terraplane chassis to them. They had decided that it “just wasn’t cricket” for Hudson to also supply the straight eight Terraplane chassis to Brough Superior also. The result was that Hudson informed George Brough that they would henceforth only supply him with the six cylinder equipped Terraplane chassis. Twenty five of the straight eight Brough Superior cars were made: and the one pictured above became George Brough’s personal car which he nicknamed “Old Faithful” on account of its impeccable reliability. He kept the car until his death in 1970. 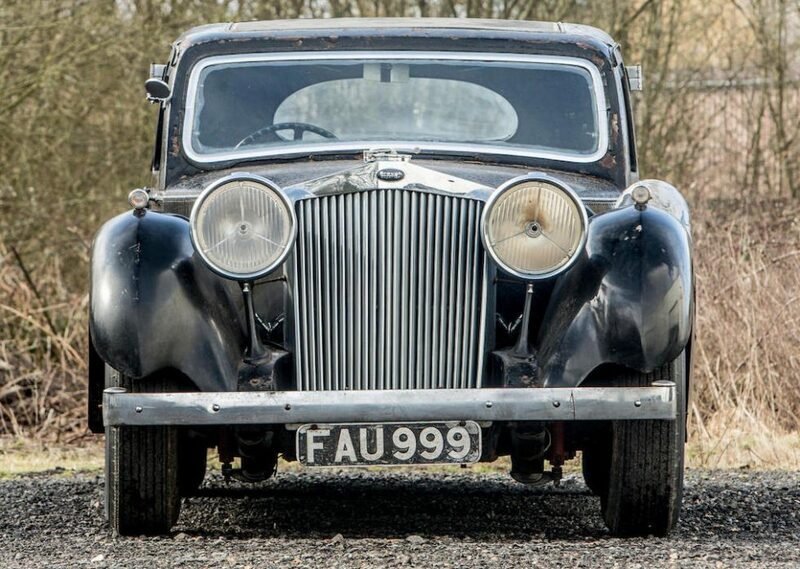 This car is coming up for sale by Bonhams at their Goodwood Festival of Speed sale to be held on July 13th, 2018, and you can find the sale page with further details if you click here. Brough Superior 3½ liter Dual Purpose. With his supply of straight eight Terraplane chassis cut off George Brough had no choice but to build his cars on the 3½ liter chassis. Curiously these cars, being a tad lighter and four inches shorter, tend to be more lively handling than their straight eight predecessor. Straight line performance of the 3½ liter car with its six cylinder side-valve engine was slightly less than the eight, as one would expect. 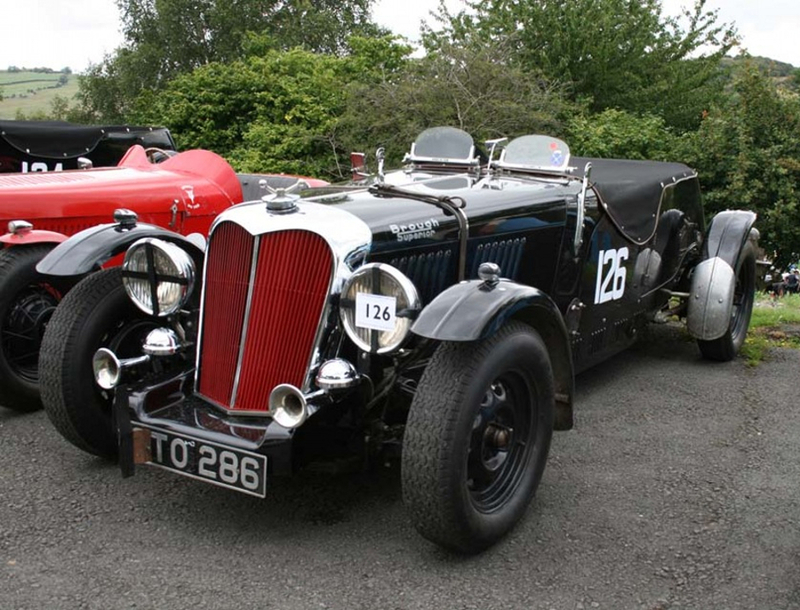 The engine was RAC rated at 21.6hp and produced 107bhp, giving the car a standing to 60mph time of 12 seconds. George Brough was not going to allow his cars to be inferior in performance however and he also offered a supercharged version which produced 140bhp (i.e. more than the straight eight) and which gave the lighter 3½ liter model superior performance. 1936 Brough Superior 3½ liter Dual Purpose. Note that George Brough designed the radiator grille to be reminiscent in shape to the fuel tank of his motorcycles. (Picture courtesy rjmorris.ca). (Note: You will find the above pictured car at Robert J. Morris if you click here). 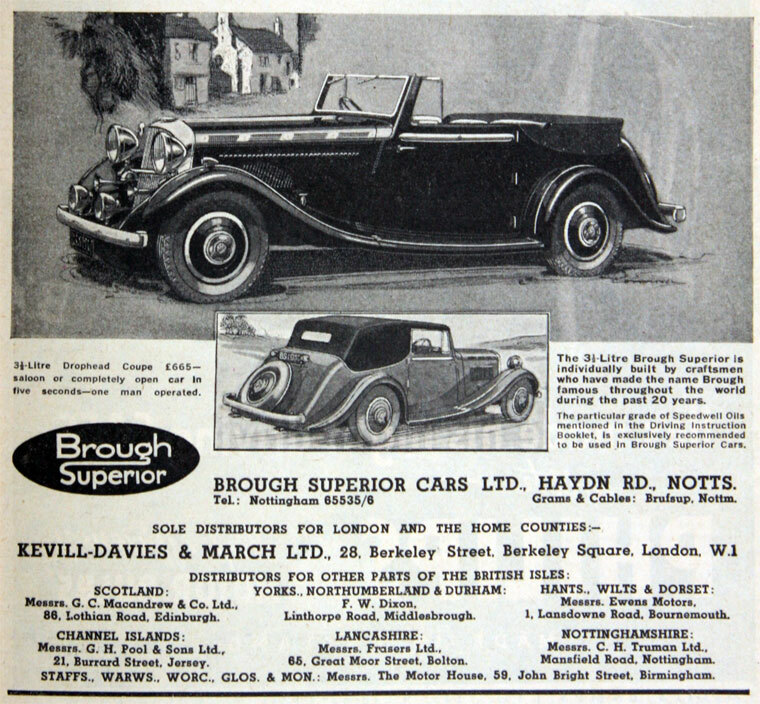 The Brough Superior 3½ liter was made in two versions, the “Dual Purpose” convertible, and the four door saloon. About eighty of the Dual Purpose convertibles were made making this by far the most numerous of the Brough Superior automobiles. 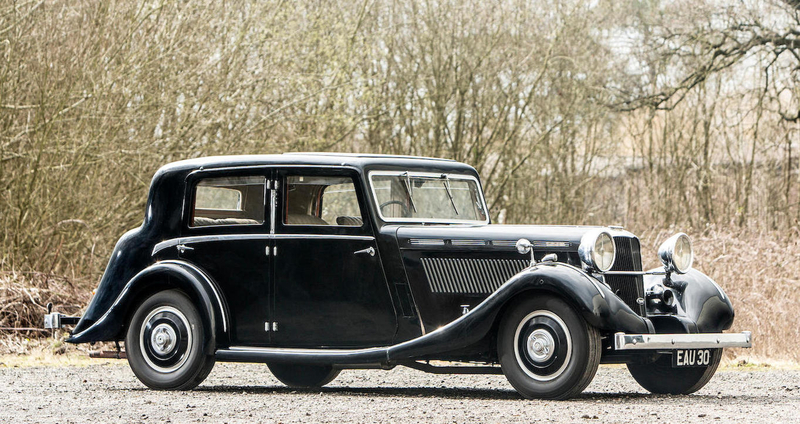 1937 Brough Superior 3½ liter Saloon. 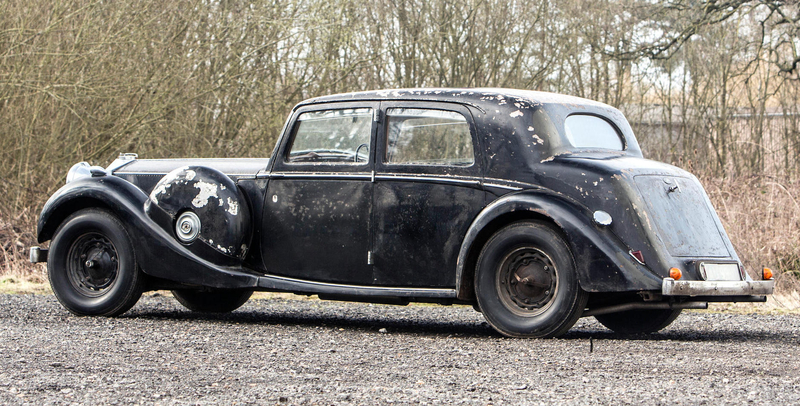 The Brough Superior 3½ liter Saloon was simply the same car as the “Dual Purpose” but fitted with a fixed roof saloon (i.e. sedan) body for those who preferred something more reliably weatherproof. Britain is notorious for rain and inclement weather so this body style makes more sense, whereas those who live in places like California might be more inclined towards the Dual Purpose convertible. The 3½ liter six cylinder Brough Superior engines were not fitted with the aluminum cylinder head cover but left just as they had come from Hudson. 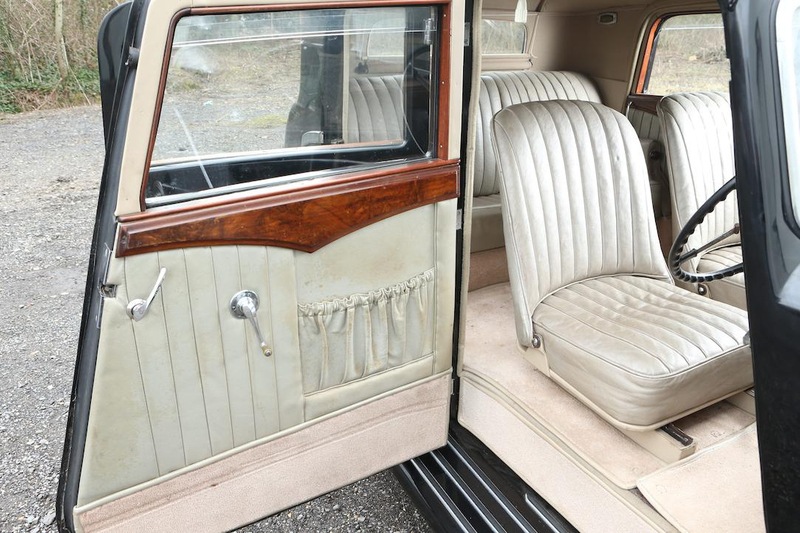 The interior of the Brough Superior Saloon was trimmed to the best standards of W C Atcherley’s coachworks and were easily the equal of Rolls Royce and the other top end British builders. Despite the fact that this was such a practical and beautifully built model only three of the saloon bodied Brough Superior 3½ liter were made. 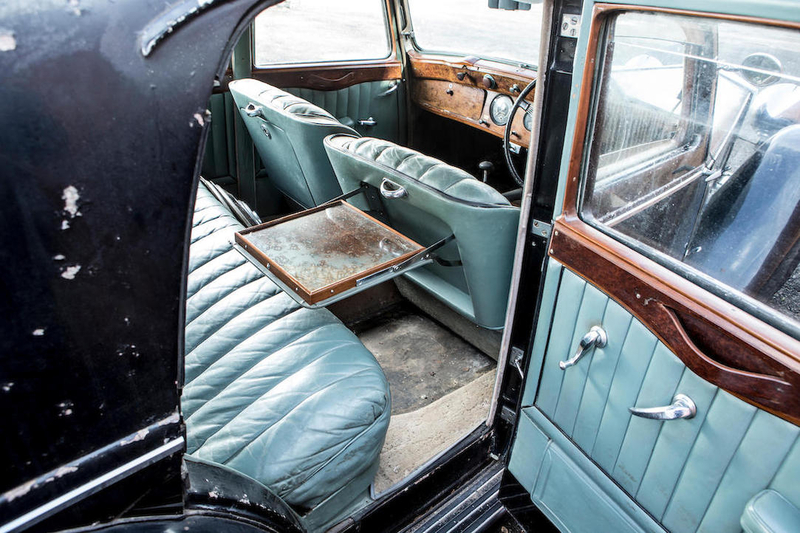 The interior of the Brough Superior 3½ liter Saloon was up to W C Atcherley;s highest standards. 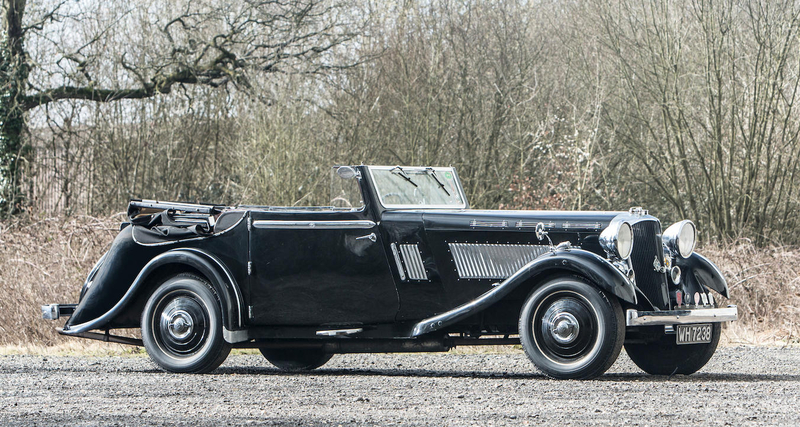 The above pictured Brough Superior 3½ liter Saloon is coming up for sale by Bonhams at their Goodwood Festival of Speed auction to be held on July 13th, 2018. Expected sale price is in the range £25,000-£35,000. There was only one Brough Superior 3½ liter Alpine Grand Sports car made and it was built on the same Hudson Terraplane chassis as the other six cylinder Brough Superior cars. The car was supercharged with the engine delivering 140 bhp and giving the car a standing to 60 mph time of 9.6 seconds. Top speed was 107 mph for this sleek and lightweight sports car and it remains one of the most interesting British sports cars of the 1930’s. 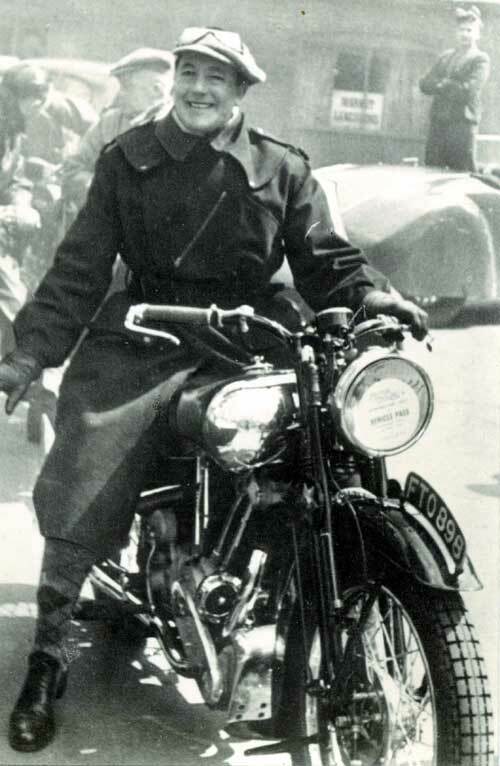 The Brough Superior “Girl Pat” Alpine Grand Sports featured bodywork by E.J.Newns of Thames Ditton, Surrey. (Picture courtesy drive2.ru). The Brough Superior Alpine Grand Sports was nicknamed “Girl Pat” and its coachwork was done by E.J.Newns of Thames Ditton, Surrey. George Brough was a man who was persistently seeking to create something better, not only better than what he had previously achieved, but better than those around him. So it comes as no surprise that he was not content with his cars based on the Hudson Terraplane and so set out to create something even better and more prestigious: something that might even turn out to be more desirable than a Rolls Royce. The Brough Superior XII was the last model George Brough made. The Brough Superior XII was made on a chassis designed by engineer Harold ‘Oily’ Karslake in collaboration with George Brough. The chassis of this new car was built using the then new arc welding, and it is likely to have been the first British car to use this welding method (Note: Only the side members were not arc welded, but this car did not use rivets in its construction). Instead of a 3½ liter six cylinder Terraplane engine this new car was fitted with a Lincoln Zephyr V12 of 4½ liters capacity. The Brough Superior XII was designed to be spacious with exceptional visibility. This car was designed to appeal to the upper end of the luxury car market. 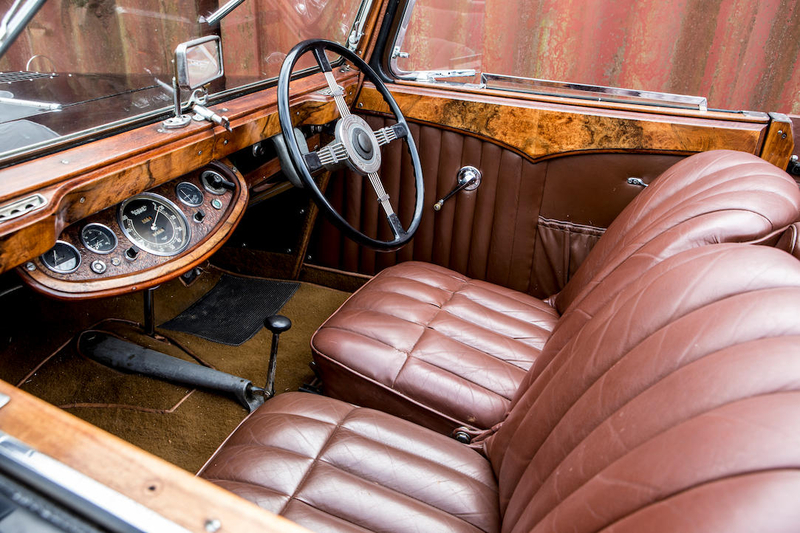 In an article for Veteran and Vintage magazine Harold Karslake said ‘the seating was to be as roomy and comfortable as possible, ample leg room, easy of access, good headroom, and above all excellent visibility all round. All seats within the wheelbase, and ample luggage space’. The XII was indeed a roomy car with a very ample luggage capacity. The front interior was spacious as the rear, with strategically placed arm-rests. 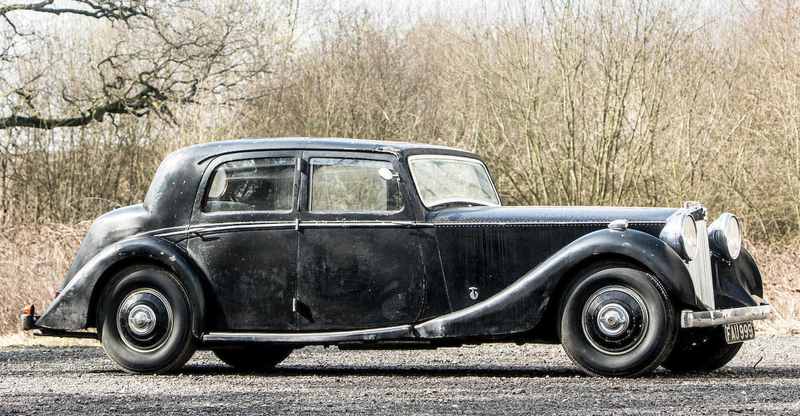 The Brough Superior XII was to be a car that would rival the luxury and silent smoothness of the best Rolls Royce could offer. Harry Karslake said when the car was running ‘no vibration whatever could be felt from the power unit, and the only indication that the engine was running was the green jewel on the dash indicating pressure in the oil circuit’, while ‘the extreme rigidity of the chassis frame and the flexible mounting of the body on the sides of the chassis ensured absence of and body noises of any sort’. 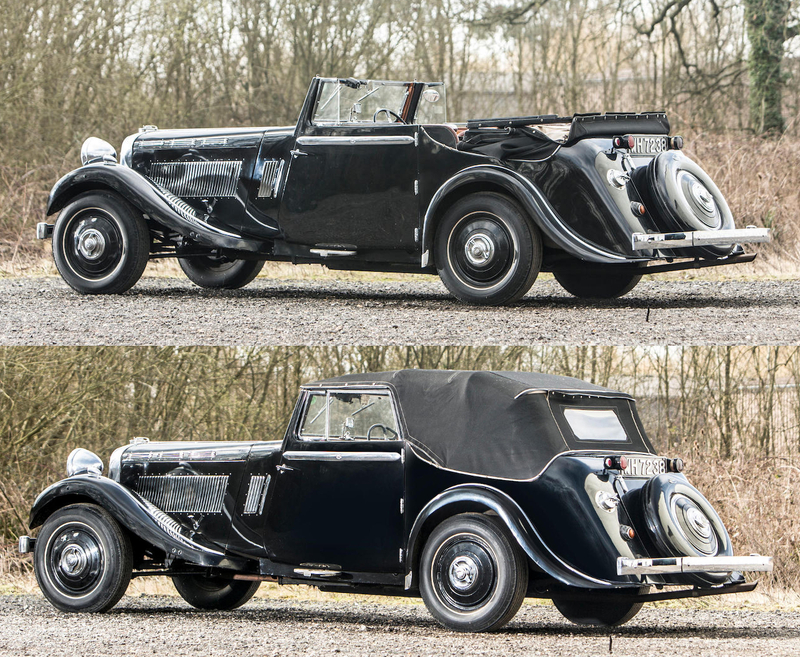 The Brough Superior XII, with its long bonnet/hood presents with a more exciting appearance than the typical Rolls Royce cars of the period. Engine and passenger space are all within the wheelbase. Although three chassis were constructed only one Brough Superior XII was completed and that is the one pictured above. This car is also coming up for sale by Bonhams at their Goodwood Festival of Speed sale to be held on July 13th, 2018. You will find the sale page for this unique automobile with further details if you click here. This car is expected to sell in the range £15,000-£25,000. George Brough is most famous for his motorcycles and his motor cars are not well known. His cars were superb however, made with the same passion for perfection as the Brough Superior motorcycles, and intended to appeal to customers who demanded the best. The total number of cars that bore the Brough Superior name was 110, of which only thirteen are known to have survived, and at time of writing only eight are in running order. These are fascinating automobiles and we hope to see more of them fully restored so they can be appreciated both for their historical significance, and for their excellence. (All pictures courtesy Bonhams unless otherwise noted).